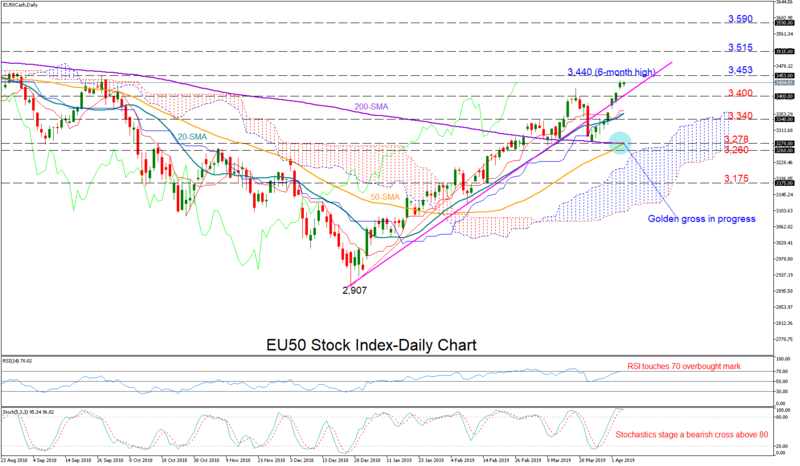 The blue chip EU50 stock index restored bullish dynamics after meeting resistance at the 200-day moving average (MA) and hit a six-month high of 3,440 on Wednesday. While the RSI and the fast stochastics are warning over an overbought market, as the former is crawling above 70 and the latter is ready for a bearish cross above 80, a golden breakout between the 50- and the 200-day MAs is in progress, a sign that the recent upward pattern may extend to the bigger picture. The market should hold above 3,400 for investors to resume confidence on the January uptrend. Otherwise, a decline below the pink line could bring further losses probably towards the 3,340 resistance-turned-support level. Breaking that barrier, downside corrections may stretch into the 3,278-3,260 restrictive region where the 50- and the 200-day MAs meet each other. Should the bears beat that wall too, a fresh sell-off could start probably towards 3,175. In the positive scenario, the market would aim for a rally above 3,453, the peak on September 27. Another leg higher could also retest resistance between 3,515 and 3,535, which if violated could push gains towards a more important barrier around 3,590. In brief, the index is in a bullish mode both in the short and the medium-term (three-month view).